2015 certainly seems to be ‘The Year of the Dachshund.’ It seems anywhere you look there is one of these lovable hounds, from TV adverts to teapots, they are appearing everywhere. 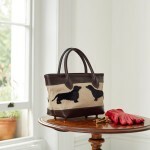 You simply can’t help but be drawn to the cute sight of a dachshund themed item. 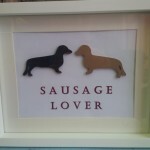 Here at ‘Mad About Dachshunds’ we love to hunt out dachshund themed gifts and thought we would share some of our favourites with you. 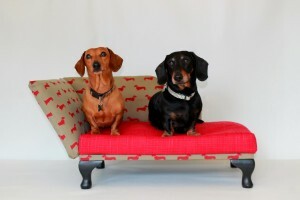 These great buys are a must have for any dachshund lover and we hope they give you some inspiration when choosing a Christmas present for that special person who loves a dachshund, or even for your beloved hound! 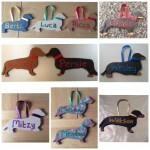 Handmade gifts by Dachshund Creations– everything you could possible wish for…from pictures to Christmas decorations. 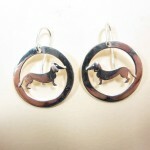 We are sure you will be able to find something extra special and unique for any dachshund lover. BOW WOW! 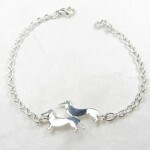 A must-have whimsical indulgence for all dachsie aficionados! The perfect Christmas present too. Mandarina’s wonderful dachshund pattern pumps are hand-made with Emily Bond’s iconic linen pattern and come in 4 great colours. 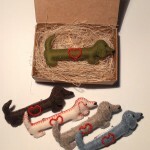 Smooth and wirehaired options! Available exclusively at Madarina Shoes . 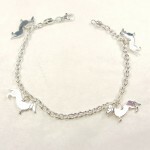 Currently 10% off to all MAD owners, quote MAD1516 at checkout. 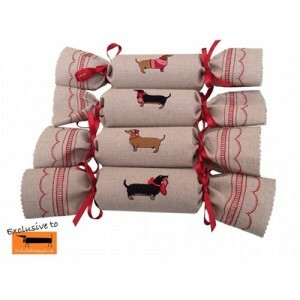 Capturing the essence of the festive season, these reusable Dachshund Christmas crackers/place markers will last year after year. 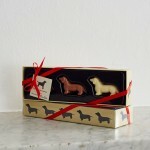 The crackers are made in England by the very talented designer, Kate Sproston and are exclusive to Devoted To Dachshunds Limited. The crackers are made from natural linen and embroidered with satin thread. Each cracker is tied at either end with a festive red satin ribbon. Inside is a durable plastic inner tube for you to fill as you wish. Alternatively these crackers could be used as a perfect container in which to present a fab piece of jewellery to your loved one! NB These crackers don’t contain snaps! To open, just untie one end of the cracker. Choose from 4 designs: Black & Tan with Stocking, Black & Tan with Scarf, Red with Christmas Jumper, Red with Santa Hat. Crackers are sold singly at a price of £12.50 each but there is a saving of £6 when buying a set of four. Christmas cards and tea towels London Pooch has it all. 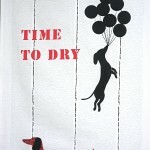 London Pooch TEA TOWELS make that perfect kitchen gift for all discerning dachshund owning arty cooks. 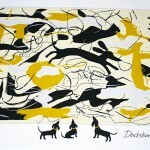 Dachshund Pollock and Time to Dry Tea Towels printed in the UK on 100% cotton.£10 each. 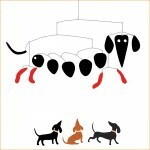 Greetings Cards from London Pooch are the perfect card for any dachshund lover which pays homage to MC Escher. 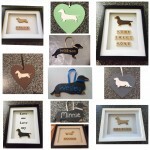 Free postage to all Mad About Dachshund Fans- please email London Pooch for more details. 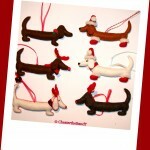 Christmas dachshunds- These are a perfect little gift and would look great on your Christmas tree. 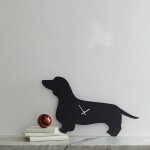 An old time favourite of ours is the wagging tail dachshund clock from The Labrador Company. 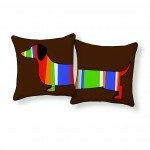 They also sell a fantastic range of luxury dachshund themed items such as cushion covers, handbags and even dachshund shaped chocolates. 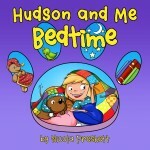 Win all five ‘Hudson and Me’ books! Each book will be personalised and ‘pawtographed’ for your child! 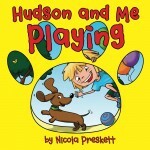 ‘Hudson and Me’ is a collection of five fun and lively children’s books, all about a lovable little dachshund Hudson! 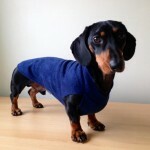 They are written by proud sausage dog owner and teacher Nicola Preskett. The books focus on the wonderful friendship between Hudson and his owner, and each has an education twist. They are the perfect story-time read with very young children, and are also great early-reading books for 4-5 year olds learning to read independently. 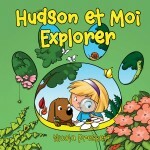 All books in the series are available in English, French and Spanish for young language learning too! What is Hudson’s full name? Hunkydory Home is run by Alison Ellerbrook who was fed up with the bland neutral interior products on the high street and so keen to provide ‘something a bit different’ she started making funky, colourful lampshades and cushions. 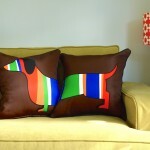 Hunkydory Home have just launched a great dachshund range of cushions. 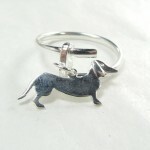 And for the dachshund in your life…. 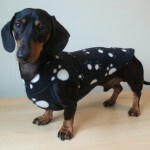 Treat your dachshund to a fabulous new coat designed and made by Debonair Dachshund. 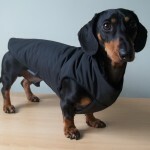 They design and make stylish, practical coats specifically designed for dachshunds. What about a fabulous Chaise Longe? These are made to order and you can choose the perfect colour and fabric to match any colour scheme. 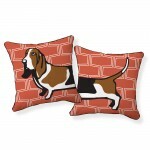 Check out Lounge Hounds to view their full range.